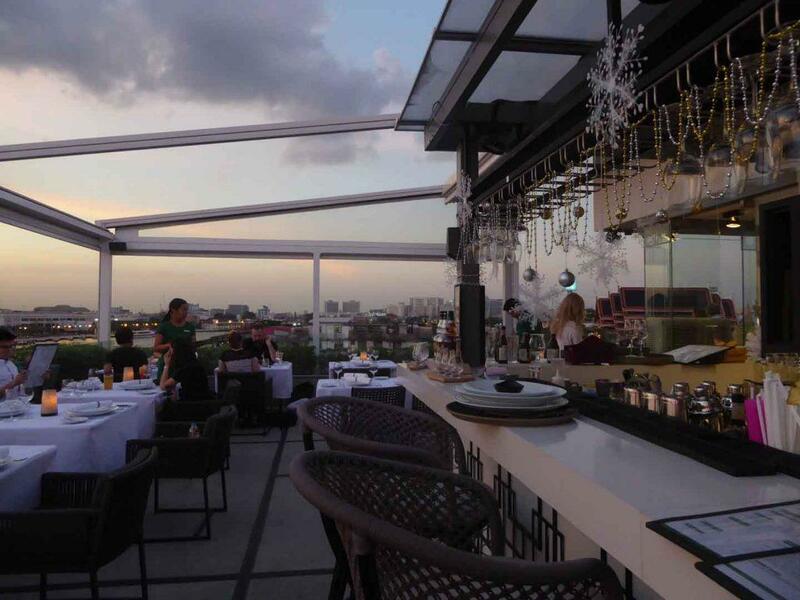 Above Riva is a rooftop bar and restaurant located on the 4th floor of the Riva Arun Hotel. The dining area has a formal look with the tables laid with big white tablecloths and wine glasses. 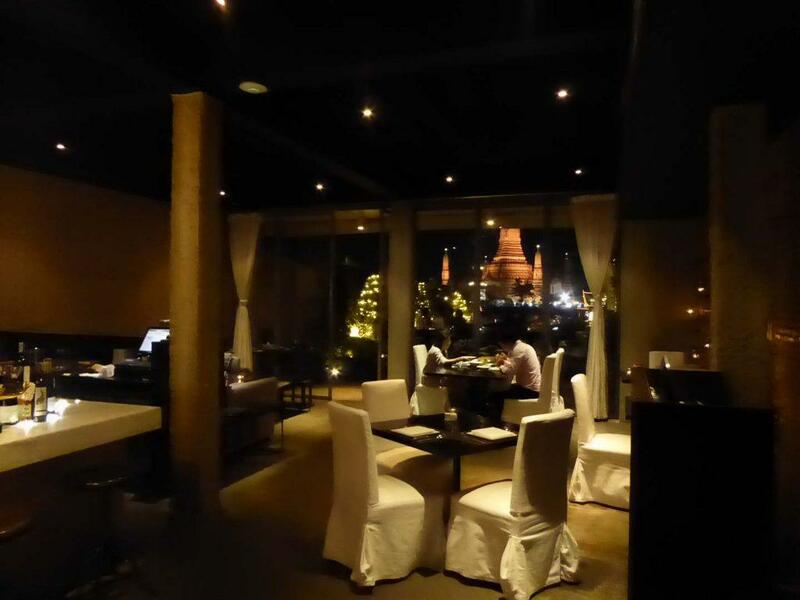 Every table is candlelit and has a splendid view of the river and Wat Arun which is directly opposite. 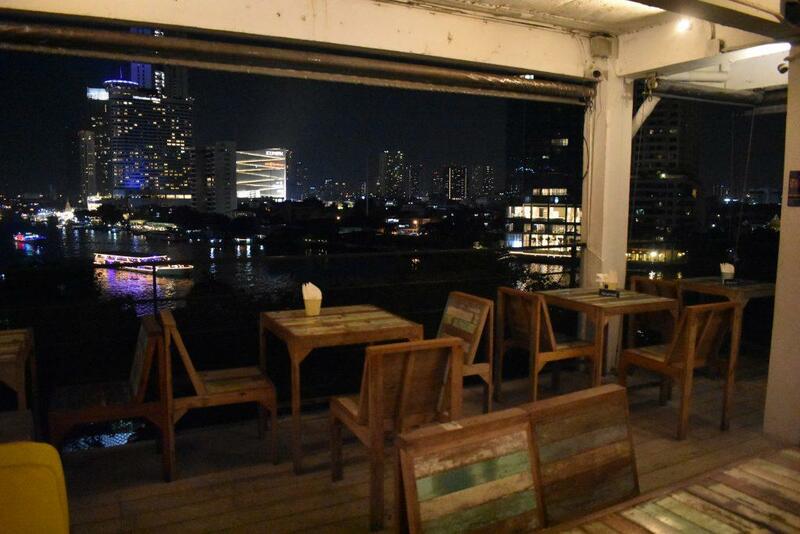 There are non-dining high tables and bar stools for casual drinkers to one side with river views as well as at the back with views over The Grand Palace and Wat Pho. The food menu is Thai fusion with mains starting at 300 baht, beers from 155 baht and spirits, wine, and cocktails from 200 baht. There is a retractable roof so you won’t get wet if it rains. Location: Riva Arun Hotel, 392/25-26 Maharat Road, Bangkok. Opening Hours: 07.30-11.30 for breakfast, 18.00-23.30 for dinner. 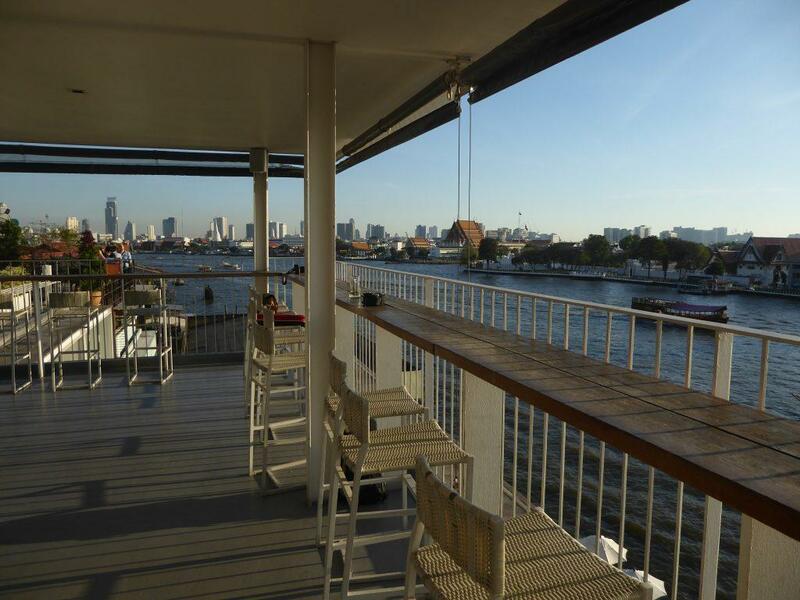 Aquatini is located next to Phra Athit pier on the Chao Phraya river. The restaurant is open 06.30-24.00 daily serving breakfast, lunch, and dinner as well as drinks. The menu is Thai and European cuisine. Prices are reasonable with beers starting at 100 baht, Cocktails from 200 baht and most main courses in the 200-500-baht range. 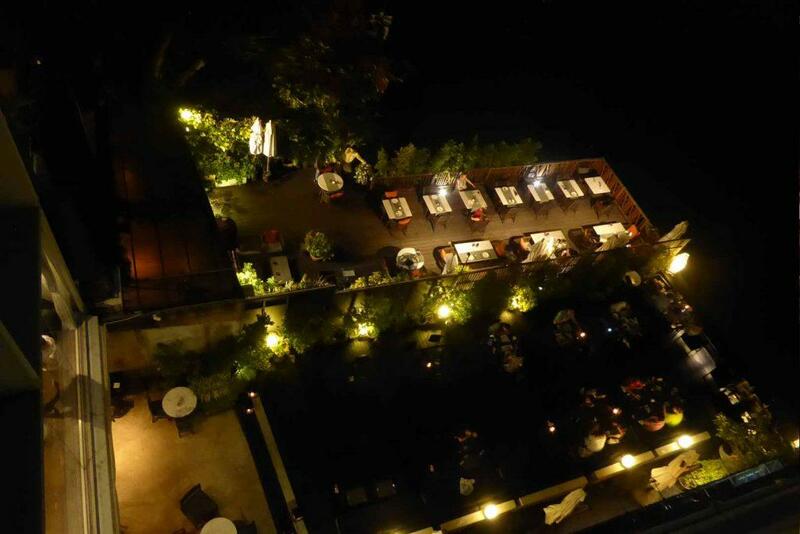 There is an open-air candlelit river terrace and an indoor air-conditioned dining room. The clientele is mostly tourists with a few locals. Location: Navalai River Resort, 45/1 Phra Athit Road, Bangkok. The Deck is a rooftop bar at the riverside Arun residence. 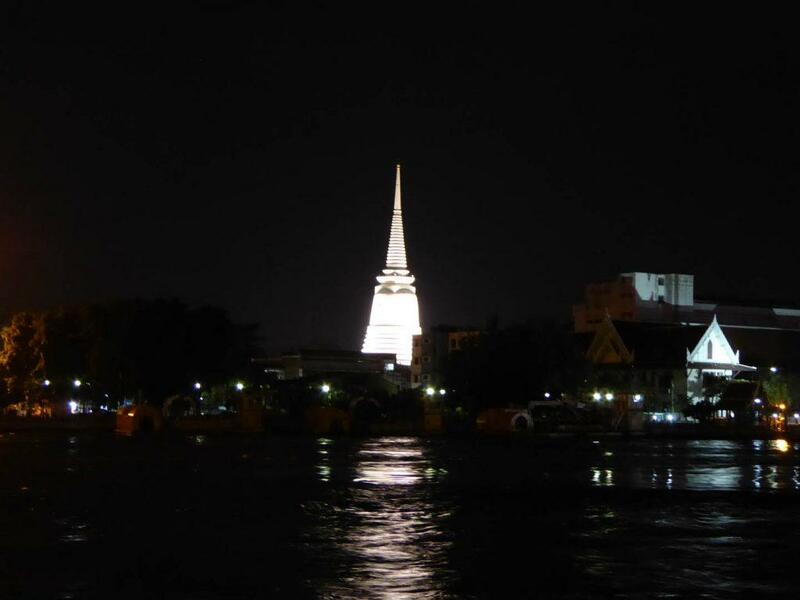 There are splendid views of the Chao Phraya river and Wat Arun which is directly opposite. Beers start a 220 baht and cocktails at 300 baht. There is a popular restaurant on the ground floor serving Thai and International food with mains in the 200-400-baht range. Location: Arun Residence, 36-38 Soi Pratoo Nok Yoong, Maharat Road, Bangkok. Opening Hours: 11.00-22.00 Monday-Thursday, 11.00-23.00 Friday-Sunday. Getting There: Taxi, Chao Phraya Express Boat to Tha Tien Pier. 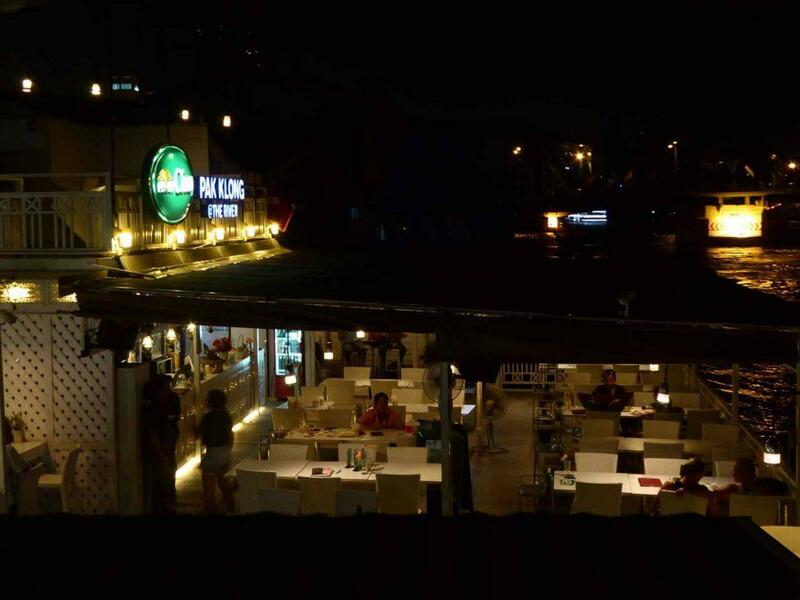 The Eagle’s Nest is a rooftop riverside bar at the Sala Arun Hotel. Next door separated by a low wall is the rooftop bar at Sala Rattanakosin. 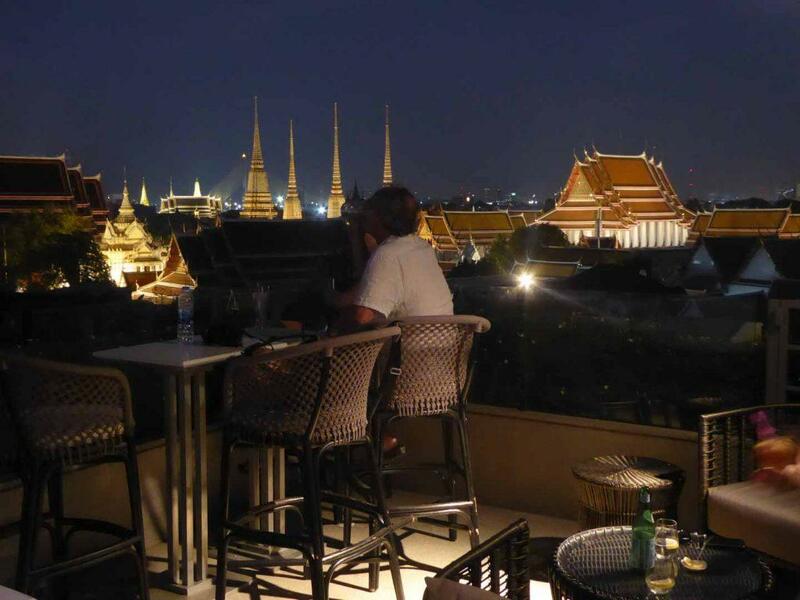 The views of Wat Arun and the river are superb and a rear lounge area with comfortable sofa seating has a view of Wat Pho and the Grand Palace. Beers start at 220 baht and cocktails at 300 baht. On the ground floor of the hotel is the Bitter Deck featuring an outdoor riverside terrace with comfortable seating and splendid views serving drinks and a Thai & international food menu with main choices ranging from 200-400 baht. Location: Sala Arun Hotel, 47-49 Soi Pen Phimarn, Maharat Road, Bangkok. 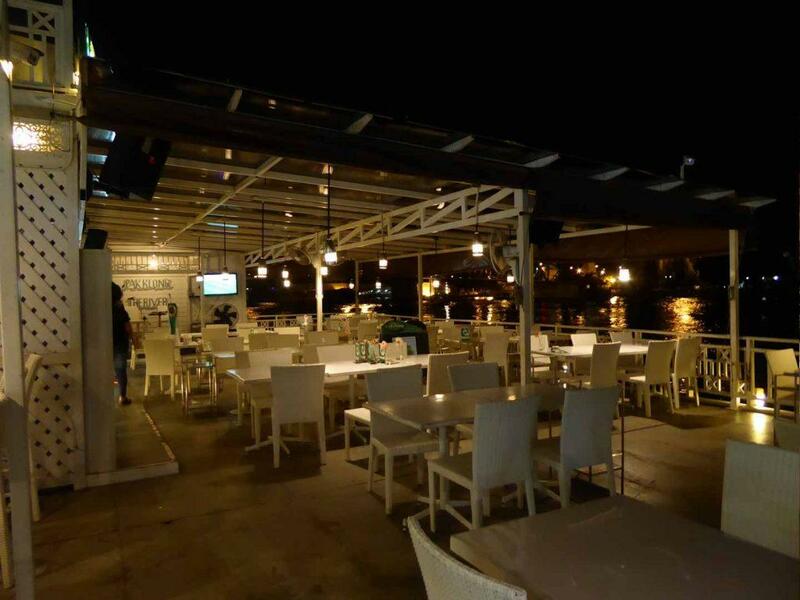 In Love is a pleasant rooftop riverside restaurant and bar next to Thewet pier with a fine view of the Rama VIII Bridge. 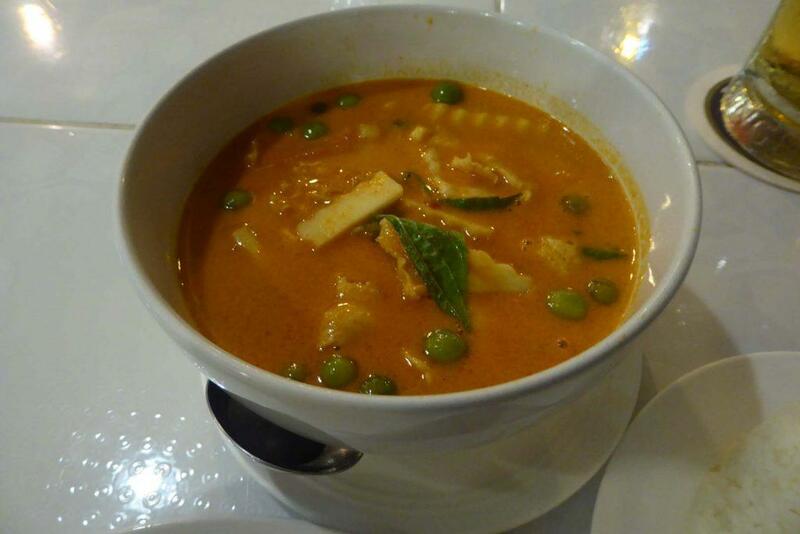 The food menu is full of classic Thai dishes such as Curries, Soups, and Spicy Salad as well as Seafood. 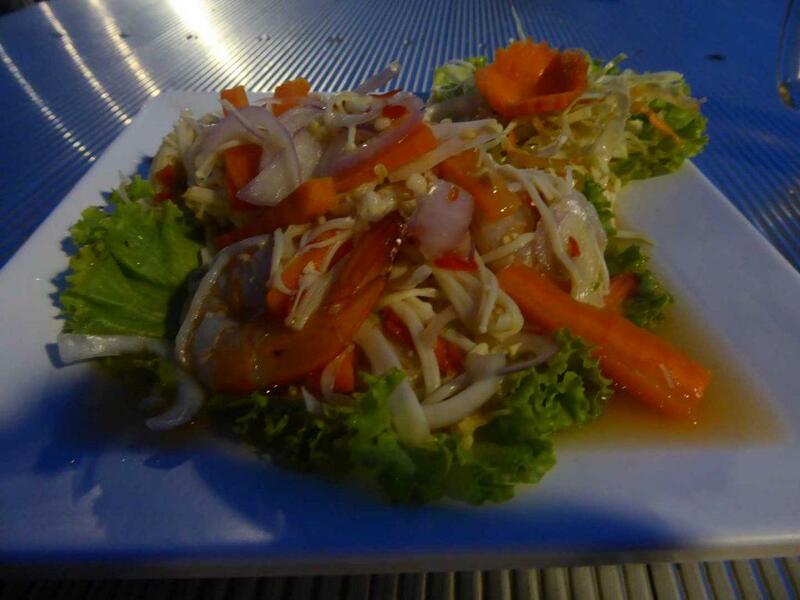 Prices are reasonable with beers from 90 baht and main courses starting from 160 baht. There is also a lower covered deck in case of rain. There is live acoustic music most nights while the clientele is mostly locals with the odd tourist. 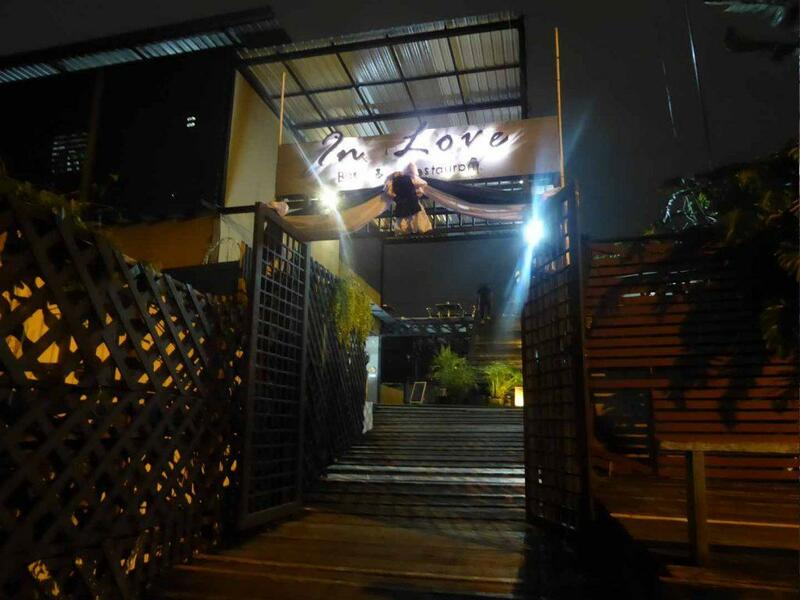 In love is a short taxi ride from Khaosan Road and is located right next to Thewet Pier. Underneath and next to In Love on the pier building is a small Thai bar with nightly live bands which makes a good after dinner hang out if you are looking for some live music. Location: 2/1 Thewet Pier, Krung Kasem Road (off Samsen Road), Bangkok. 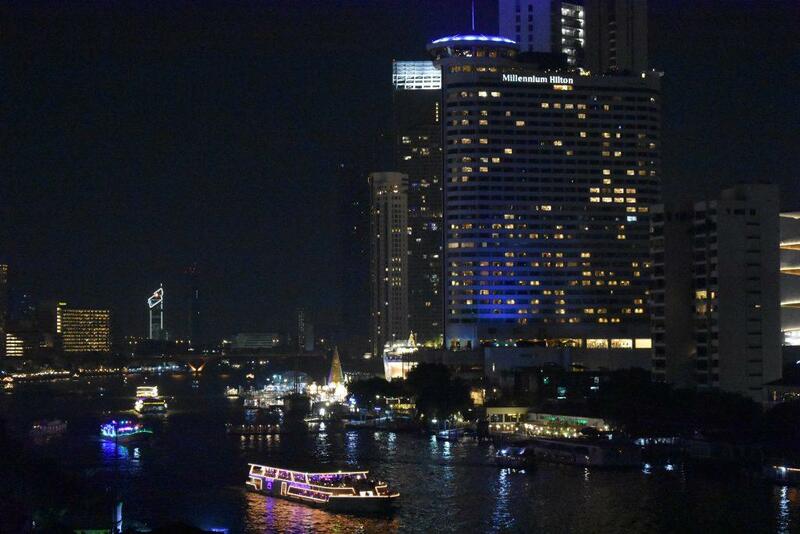 Getting There: Taxi or Chao Phraya Express Boat (Orange flag) to Thewet Pier. 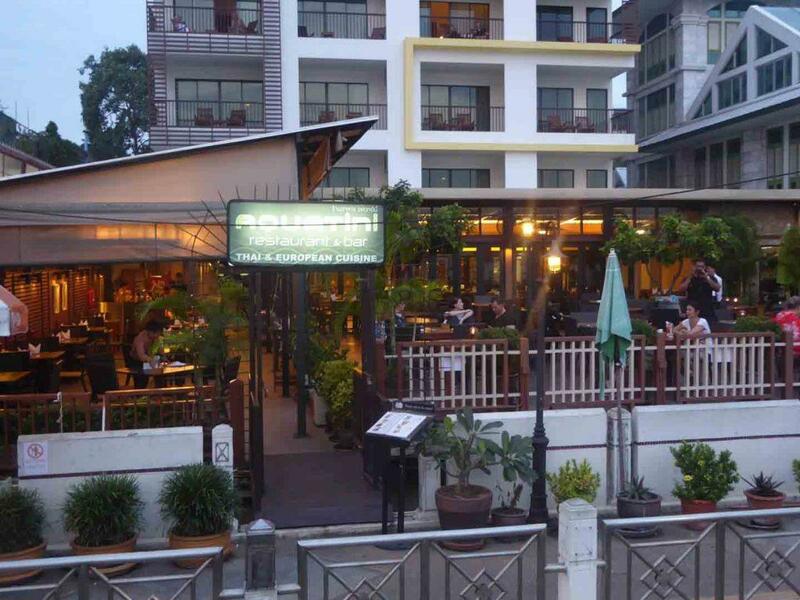 Pak Klong at The River is a small riverside terrace restaurant behind the flower market and next to Yodpiman River Walk. There are splendid views of Memorial Bridge, Santa Cruz Church, Wat Prayoon and Wat Kalayanamit as well as Wat Arun in the distance. 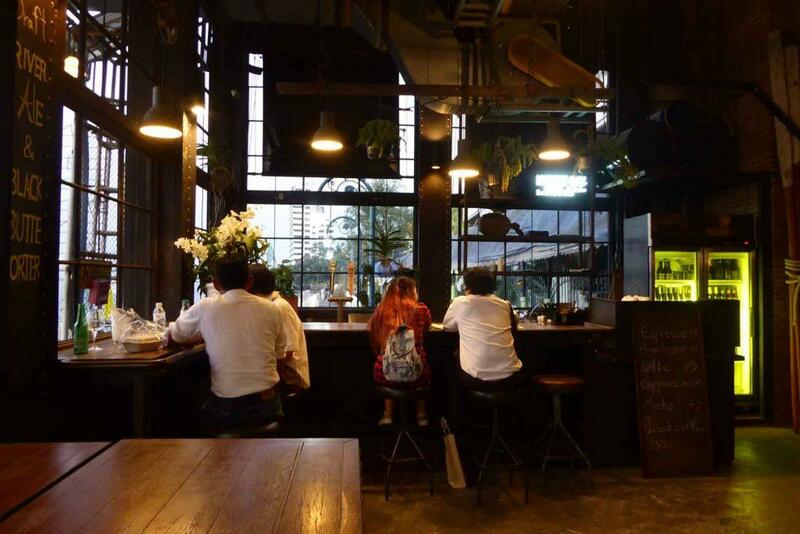 The Kitchen serves up a decent menu of International, Thai, European & Seafood with main courses ranging from 180 baht and up with beers starting at 120 baht. 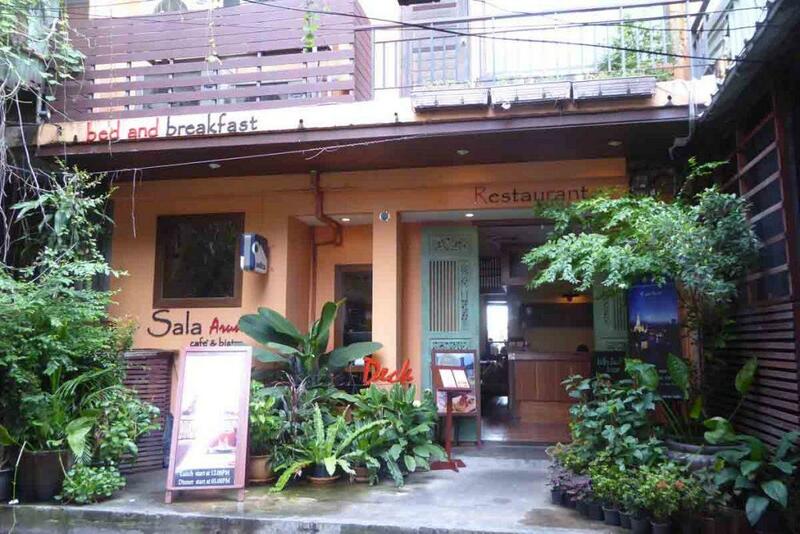 The restaurant is a short walk from Saphan Phut night market and the 24-hour Pak Klong Talad flower market. Location: Next to Yodpiman River Walk. 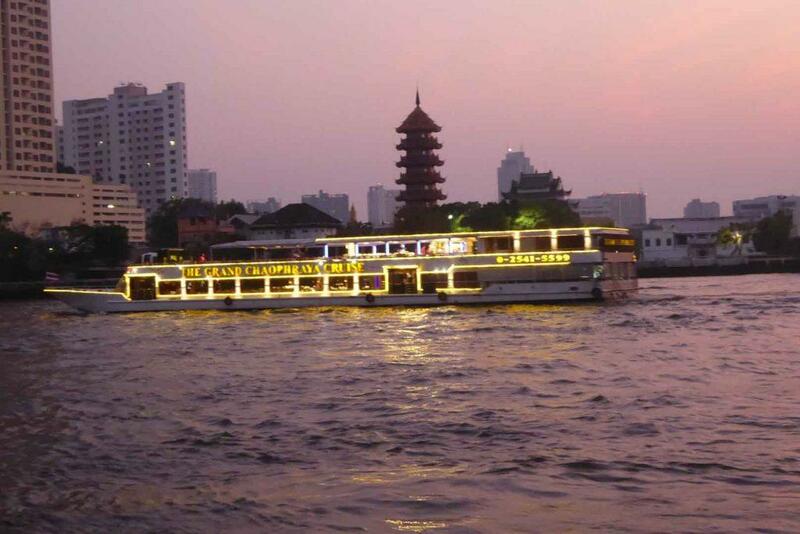 Getting There: Taxi or Chao Phraya Express Boat to Memorial Bridge Pier. 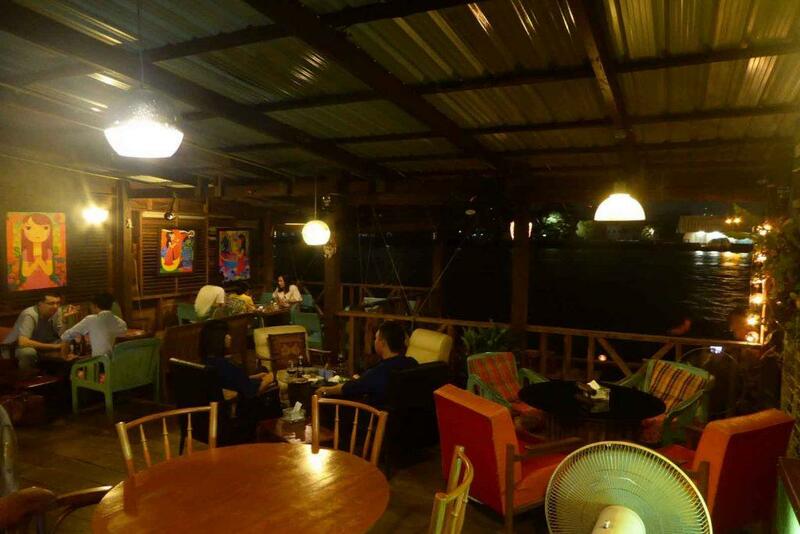 River Vibe is a rooftop bar & restaurant located in the Talad Noi area of Chinatown. It is on the 8th floor of the River View Guest House and is noted for its panoramic river views. The restaurant area is roofed though there is an upper open-air deck accessed via a spiral staircase though it’s closed during bad weather. 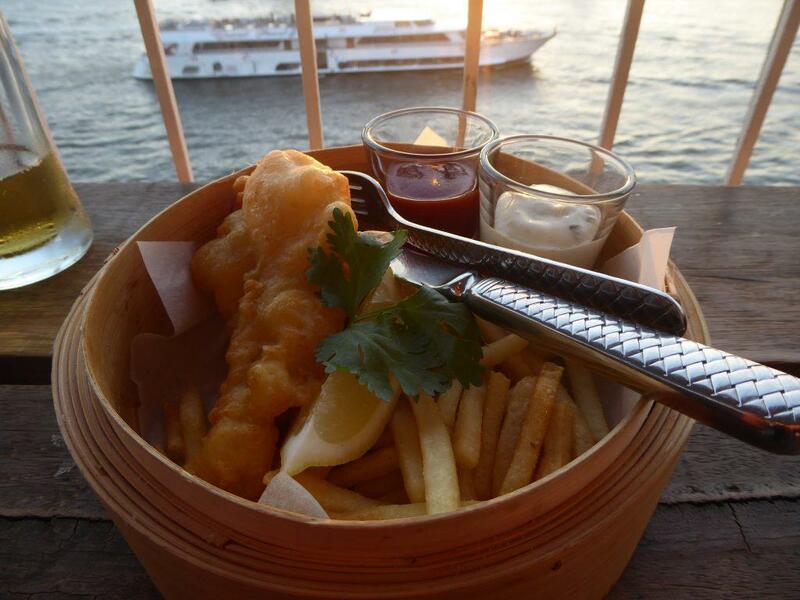 It’s best to make a reservation if you want one of the tables with the best river views. 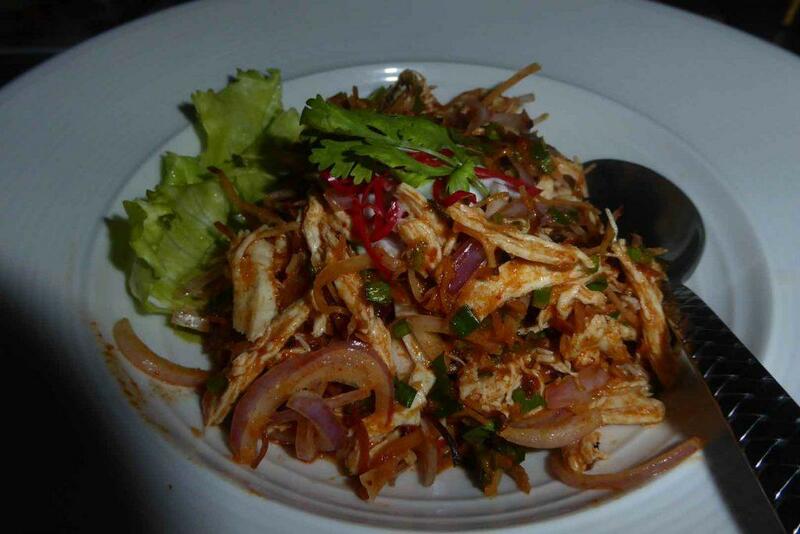 The Thai food menu is inexpensive with mains starting at 120 baht, beers from 80 baht and cocktails from 150 baht. 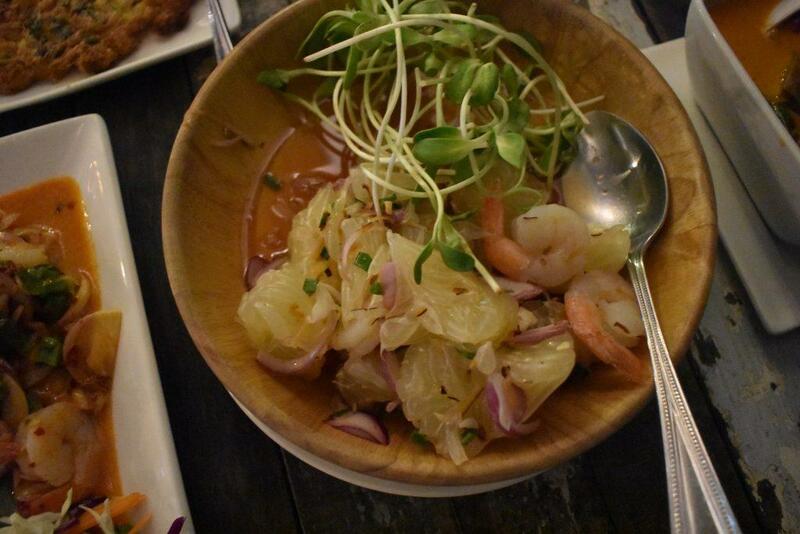 The Pomelo (Som-oh) & Prawn spicy salad is a dish you don’t find too often and is worth trying if you haven’t already. The crowd is a mixture of locals, expats, and tourists. Getting to River Vibe is an adventure as you need to find your way through narrow streets and alleys filled with old shop houses and scrap metal yards though there are several signposts to help you find the way once you reach Soi Wanit 2. When you arrive at the guest house take the lift to the 8th floor. Location: River View Guest House, 768 Soi Panurangsi, Songwad Road, Bangkok. Getting There: Taxi, Chao Phraya Express Boat to Marine Pier, walk up the alley and turn left into Soi Wanit 2 and then left again into Soi Panurangsi and follow the street to the end. 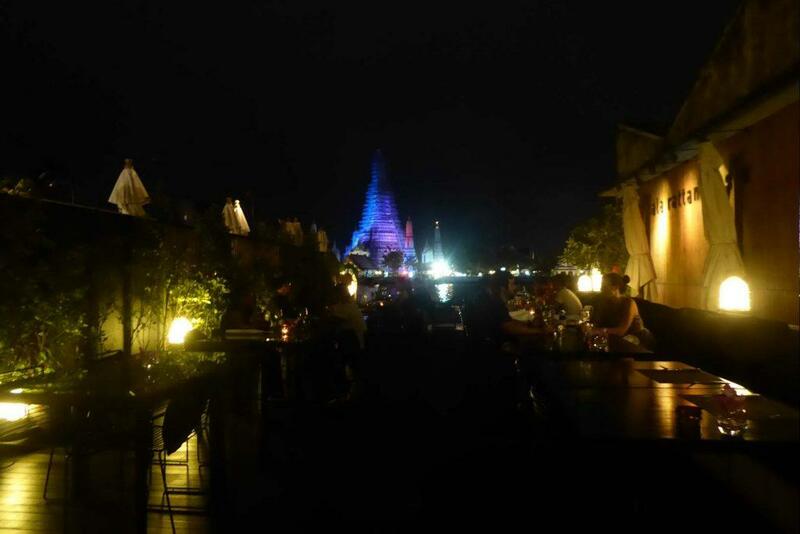 Eat Sight Story or ESS Deck is a riverside terrace restaurant that has a perfect view of Wat Arun and the Chao Phraya river. The food is Asian-European fusion with a choice of dining on the open-air terrace or an indoor air-conditioned room featuring some nice vintage décor and antiques. 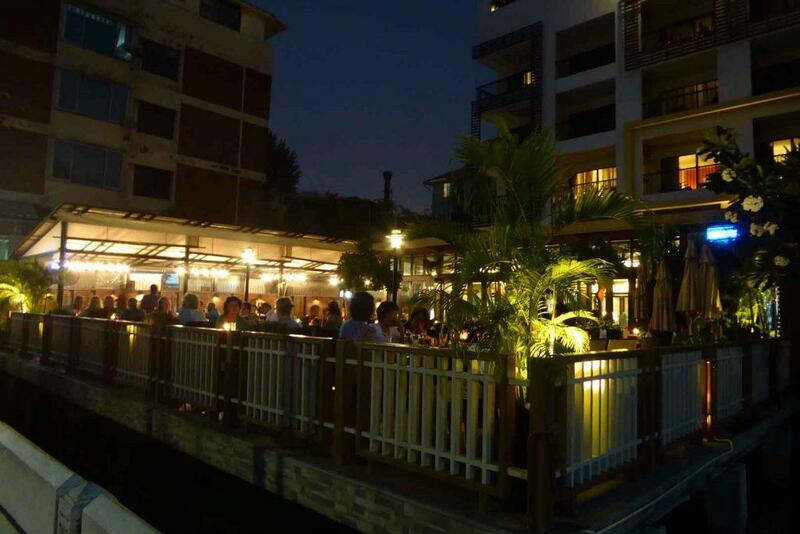 The prices are average for a riverside place with beers and cocktails starting at 220 baht and most main meals in the 200-400 range. There is also a small separate coffee bar just inside the entrance. 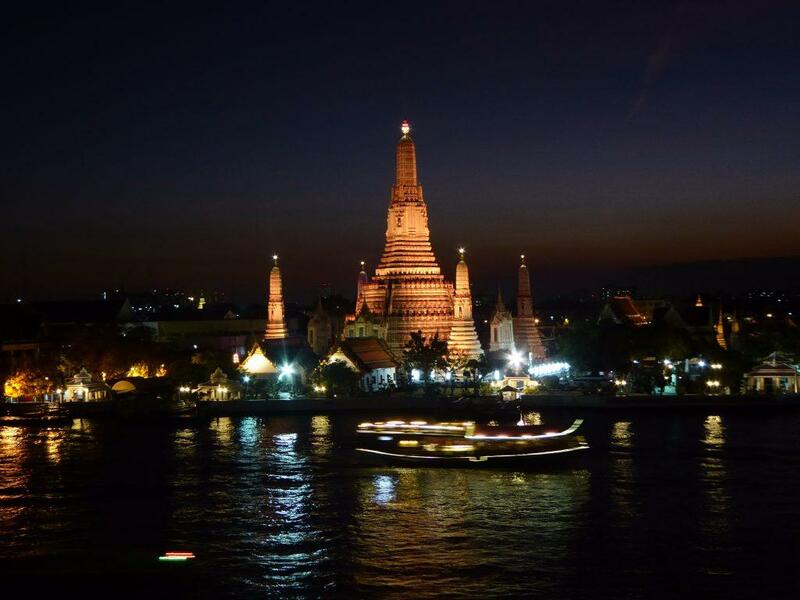 The best time to visit is just before sunset to catch the sun setting behind Wat Arun. Location: Soi Tha Tien, 45/1 Maharat Road, Bangkok. Opening Hours: 11.30-22.00 Monday-Thursday, 11.00-23.00 Friday-Sunday. 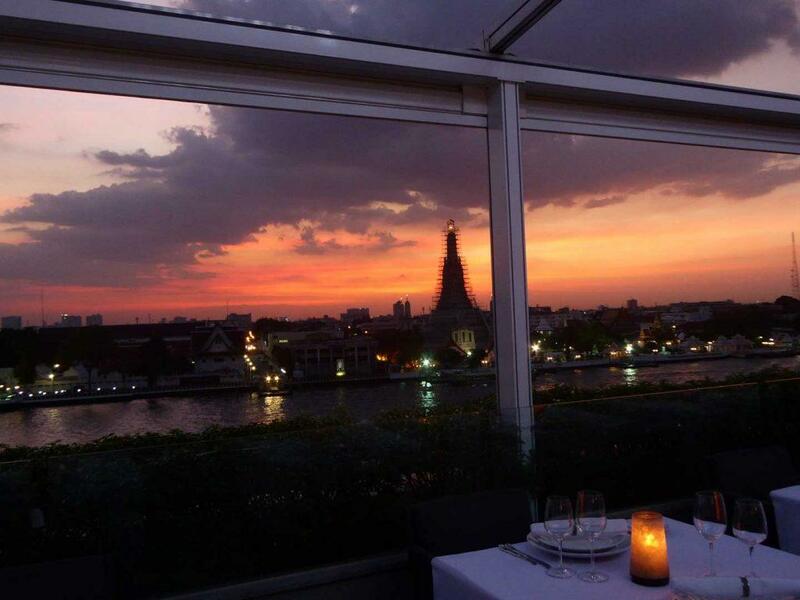 Sala Rattanakosin is a scenic riverside restaurant overlooking the Chao Phraya river and Wat Arun and is one of Bangkok’s most popular romantic dining venues. 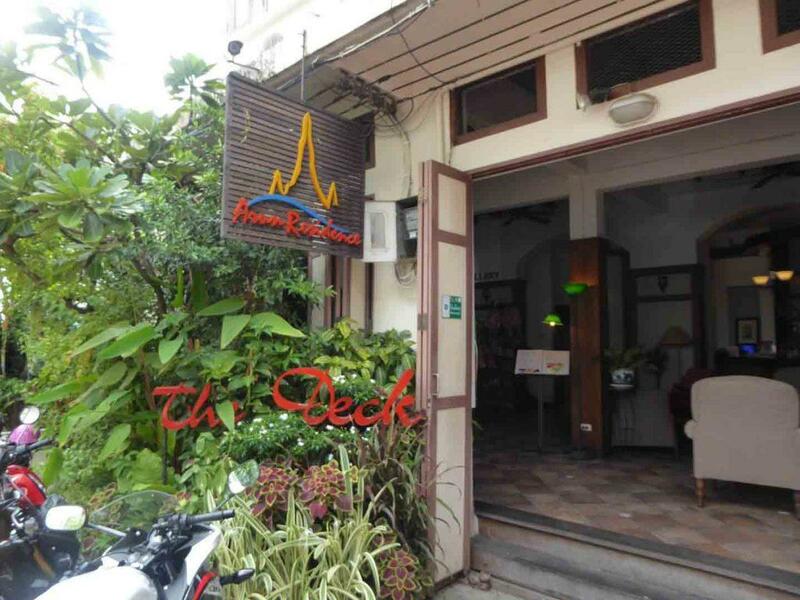 There is an outside over water wooden deck on the ground floor and an air-conditioned dining room on the first floor. 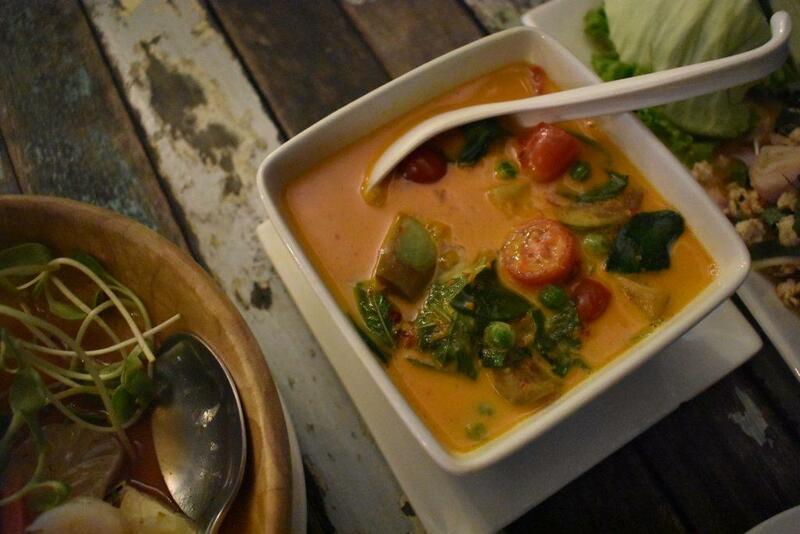 The menu features mostly authentic Thai classics with a selection of international dishes often with a Mediterranean influence. Try the Yam Gai gati, a spicy salad made from hand shredded chicken breast poached in coconut and red chili paste with a dressing of lemongrass, mint, coriander, and cashew nuts. There are only a few vegetarian options. Most main dishes range from 300-600 baht with beer starting at 160 baht, spirits at 200 baht, cocktails & wine from 290 baht. Wine by the bottle starts at 1900 baht. Tax & service (17%) are added to all bills. Making a reservation is essential if you want a table with an unobstructed view. 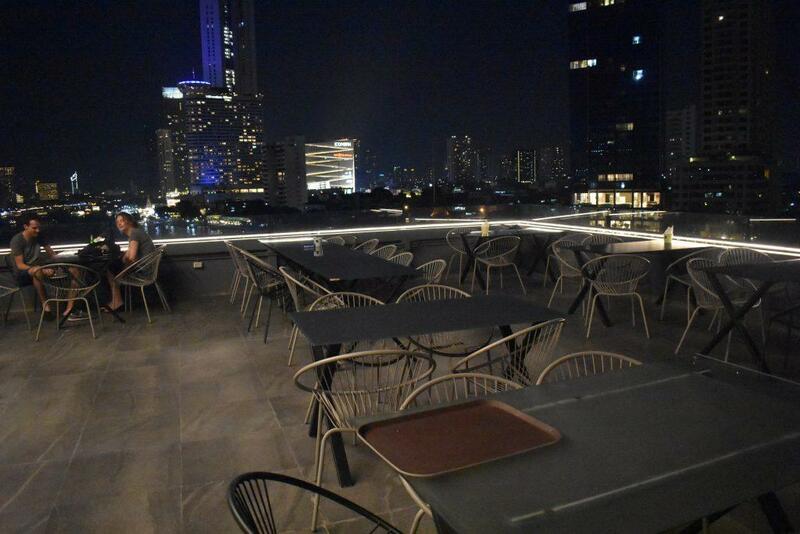 There is also a comfortable rooftop bar accessible via a spiral staircase and is a good place for after dinner drinks. Sala Rattanakosin is located on Soi Tha Tien, an alley lined with old Chinese shop houses off Maharat road opposite Wat Pho. Location: Sala Rattanakosin Hotel, Soi Tha Tien, 39 Maharat Road, Bangkok. 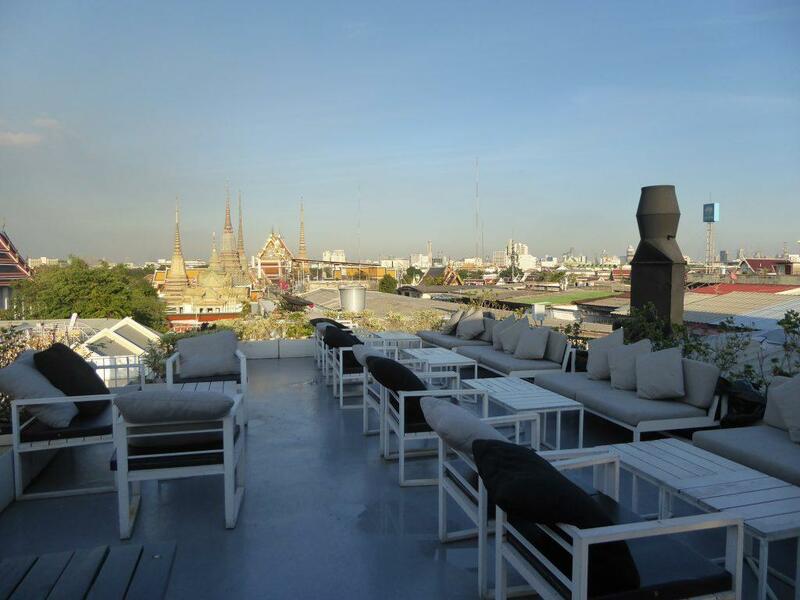 The Roof at Sala Rattanakosin is an open-air rooftop bar and lounge with impressive views of the Chao Phraya river, Wat Arun, Wat Pho, and the Grand Palace. A spiral staircase from the ground floor brings you up into the center of the bar which has two distinct zones. 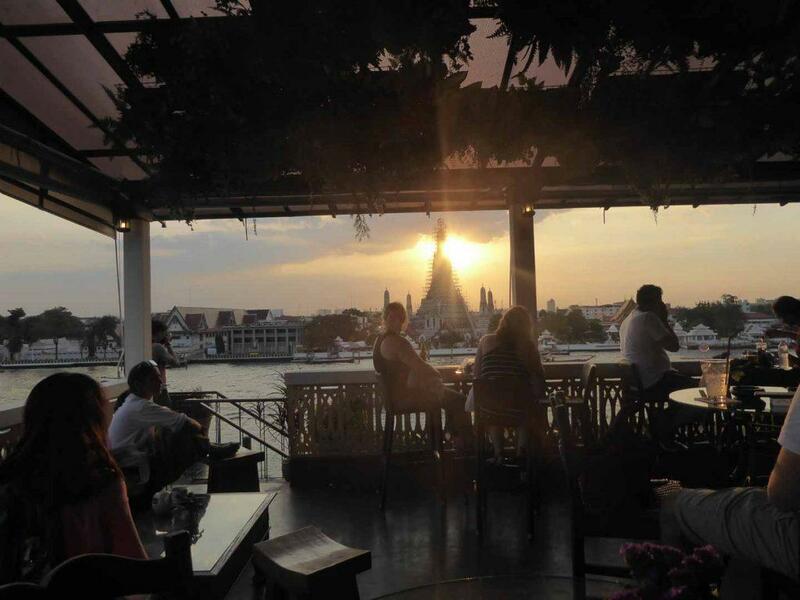 Overlooking the river is a long-railed counter with bar stools giving a stunning view of the river and Wat Arun. This spot is a favorite with photographers waiting for sunset. Behind the staircase is a comfortable lounge area with cushioned sofas and views over Wat Pho and beyond to the Grand Palace. To the left of the staircase is another small area with tables and comfortable chairs with views of both Wat Arun and Wat Pho. The bar serves beer, cocktails, wine and a tasty bar snack menu featuring a choice of fish n’ chips, beef burger, pork satay, tuna tartar baskets, and Caesar salad all at 199 baht + tax and service. Chang draught is 140 baht while bottled beer starts at 180 baht, spirits from 180 baht, wine and cocktails start at 290 baht. Soft drinks are 100 baht. 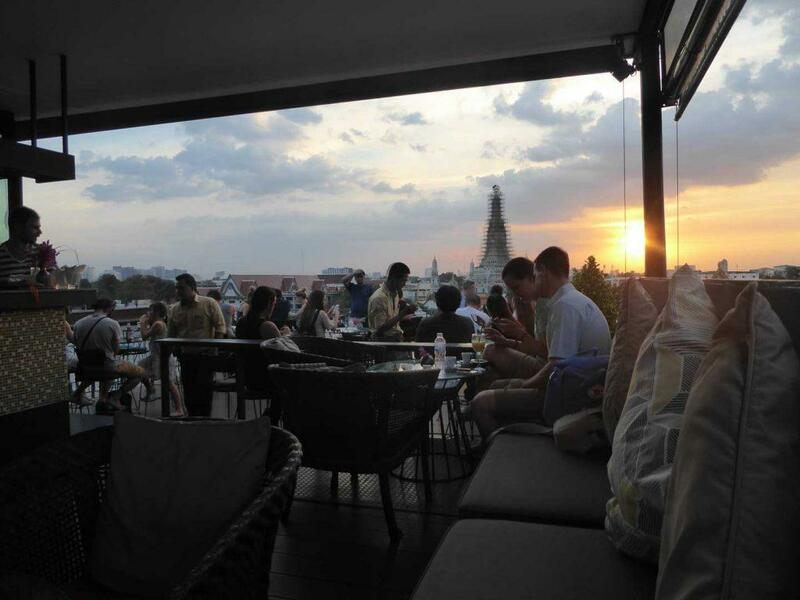 The Roof is one of the best places to watch the sunset over Wat Arun or later at night to relax while enjoying the night time views of Wat Pho and the Grand Palace. Location: 4th floor, Sala Rattanakosin, Soi Tha Tien, 39 Maharat Road, Bangkok. Opening Hours: 17.00-24.00 Monday-Thursday, 17.00-01.00 Friday-Sunday. Samsara is a small riverside restaurant bar set in an old wooden house in Chinatown on the bank of the Chao Phraya river. The house has character and is full of retro furniture, pictures, antiques, and several resident cats. 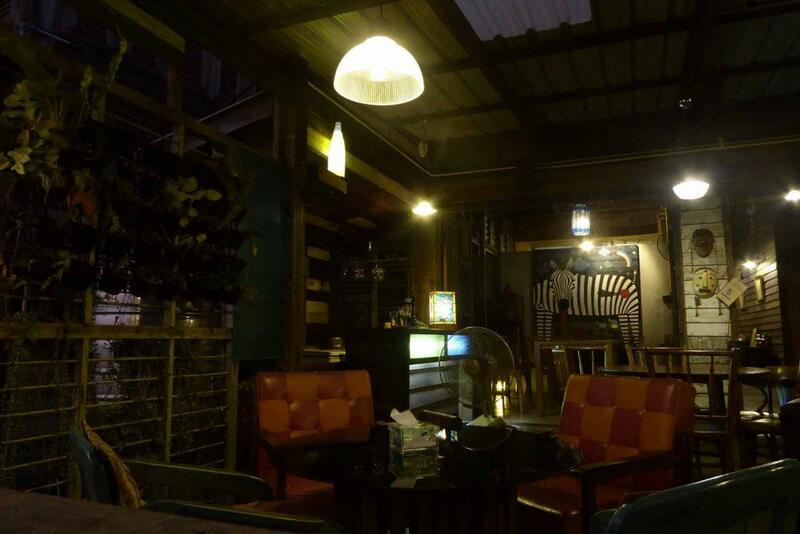 The bar is in a small alley to the side of Wat Pathum Khongkha, look for the yellow sign. 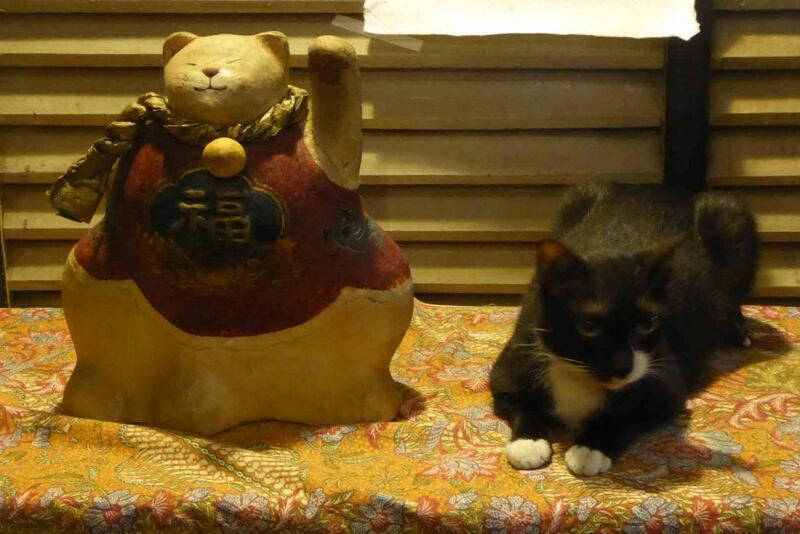 On entering you’re greeted by a Chinese style waving cat and maybe one of the real ones. 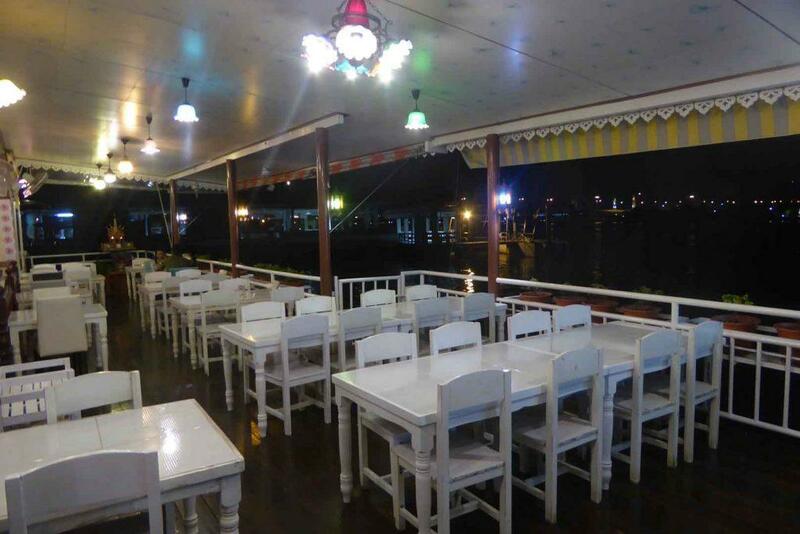 There are only 8 tables but all give a view of the river where you can watch the sunset, view a Chinese pagoda across the river and the brightly lit passing dinner cruise boats. The hand-written food menu comprises of Thai, Japanese and pasta dishes. Mains run from 100-500 baht. There is also a snack menu with choices from 50-150 baht. Try the spicy peanuts with chili, shallots and spring onion which go well with beer. There is a small but selective choice of beers including local brews, Imported and Belgian craft beers. Check out the hard to find Liger black beer from Cambodia. Beers run from 140 baht, cocktails, wine 200-250 baht, wine bottles from 1200 baht. There is a service charge of 7%. Only cash is accepted. No cards. Location: Soi Khang Wat Pathum Khongkha, Song wat road, Yaowarat, Bangkok. Opening Hours: 17.00-24.00 Sunday, Tuesday-Thursday, 16.00-01.00 Friday-Saturday. Closed on Monday. 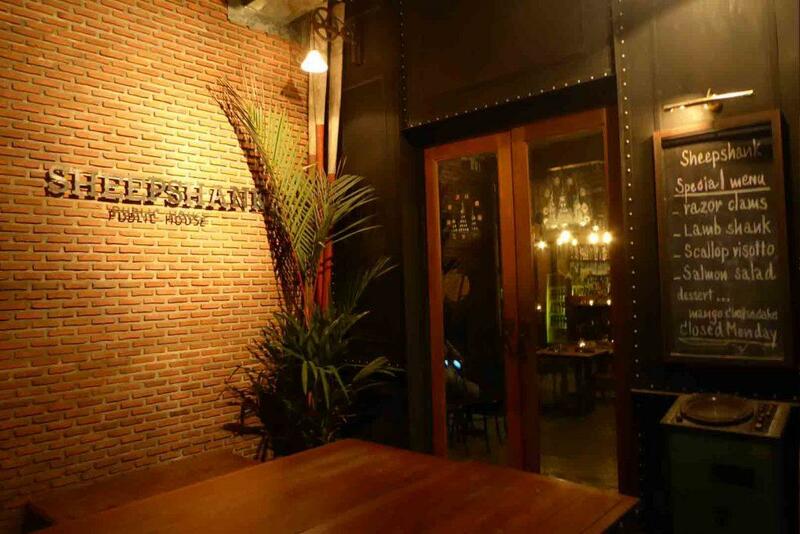 The Sheepshank Public House is in a former riverside boat repair house next to Phra Athit express boat pier. 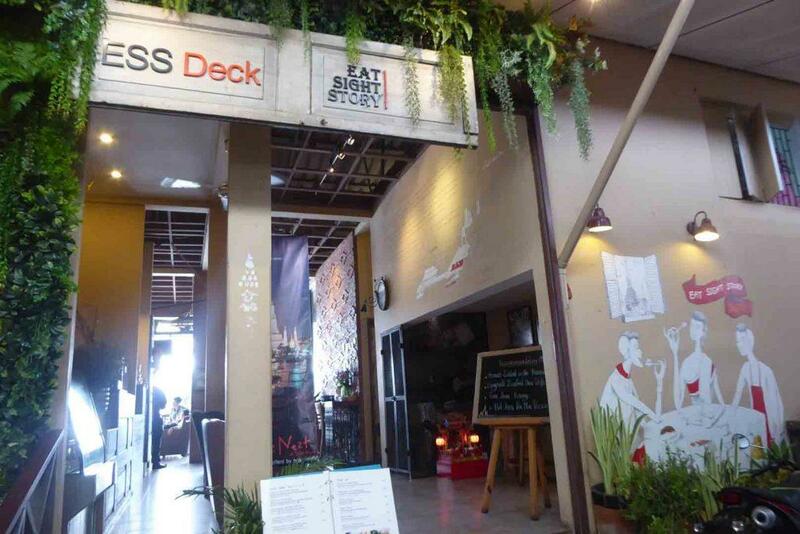 There is an indoor air-conditioned dining room with an Industrial style design featuring marine related decor such as ships ropes, pulleys, and buoys. 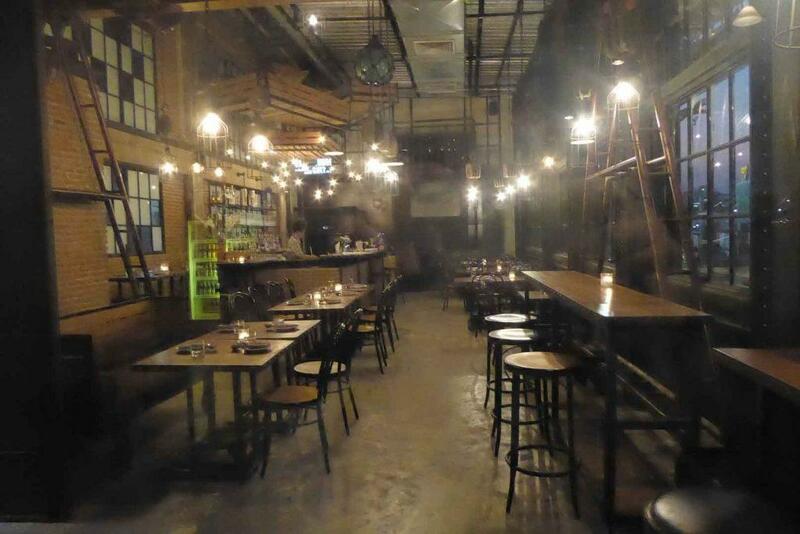 Next to the entrance is semi open-air bar serving local and craft beers on tap and by the bottle. 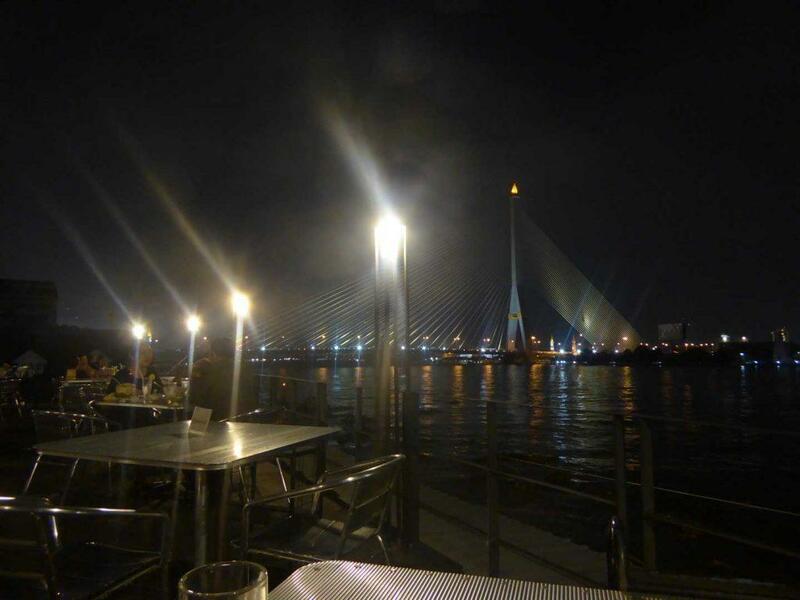 There are splendid views of the river and Rama VIII bridge. 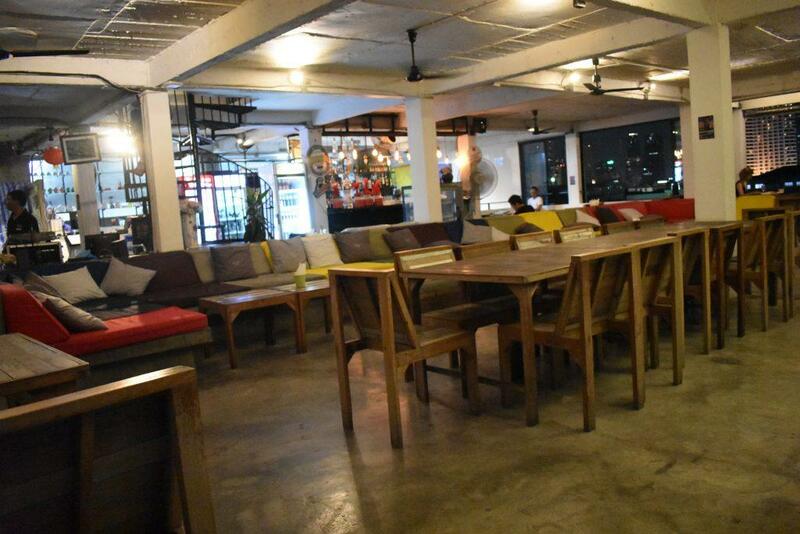 The cuisine is modern American & International with appetizers from 200 baht and mains mostly from 300-700 baht. Local beers go from 150 baht, craft beers from 240 baht, and cocktails from 280 baht. 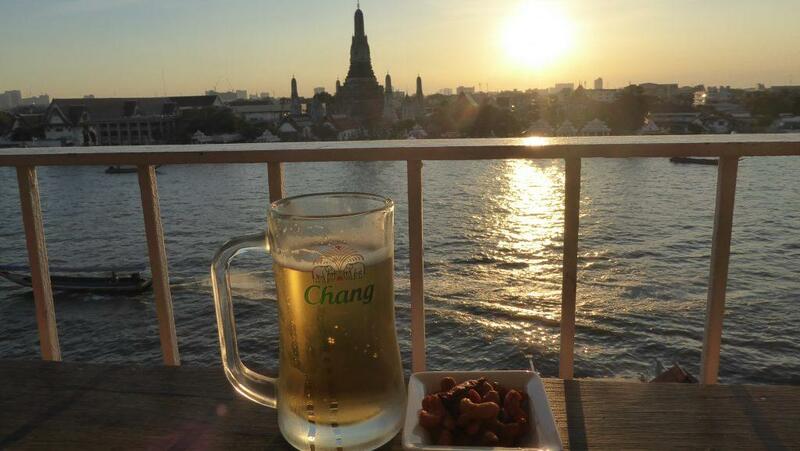 There is a daily happy hour from 17.00-19.00 which is great for watching the sunset over the river. Access is from the pier alley or through a car park behind the bar. The crowd is a mixture of locals, expats, and tourists. Location: Phra Athit Pier, 47 Phra Athit Road, Bangkok. Opening Hours: 11.00-01.00 Tuesday-Sunday. Closed on Monday. Getting There: Taxi or Chao Phraya Express Boat to Phra Athit Pier. 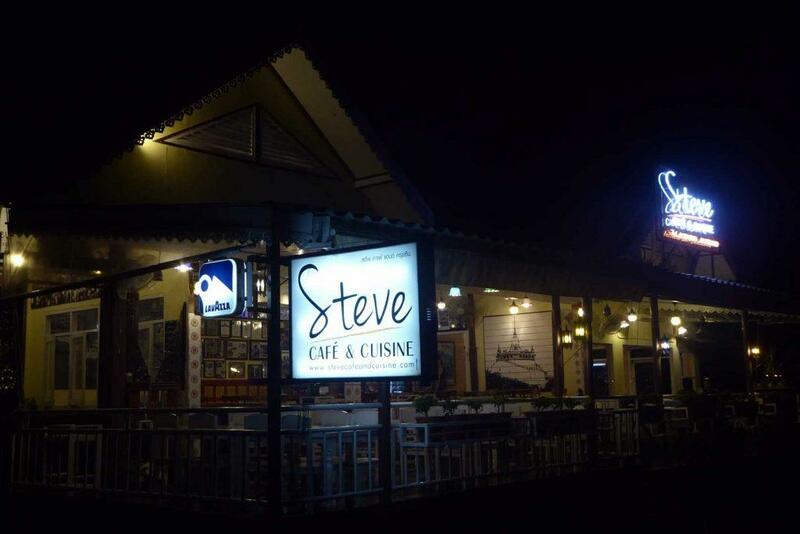 Steve Cafe & Cuisine is a riverside bar restaurant located in an old wooden house next to Thewet Pier in the Dusit district. 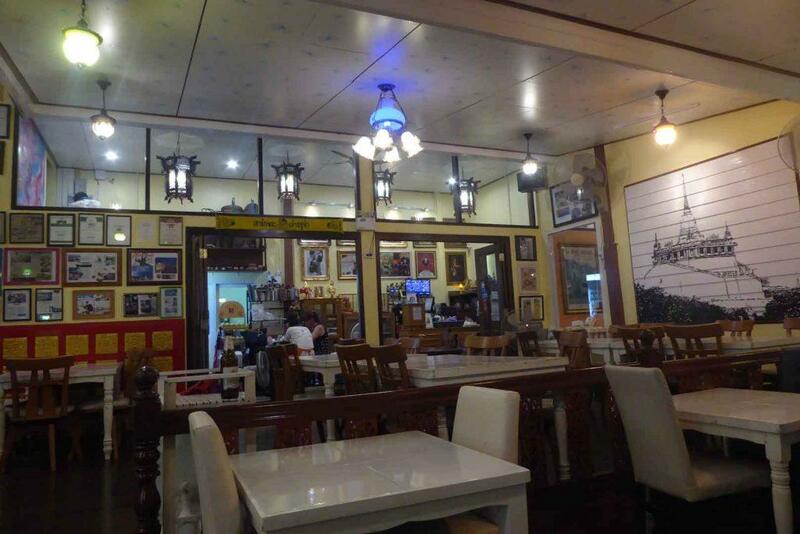 The restaurant features a retro style design and has a waterside open-air terrace and an indoor air-conditioned room. 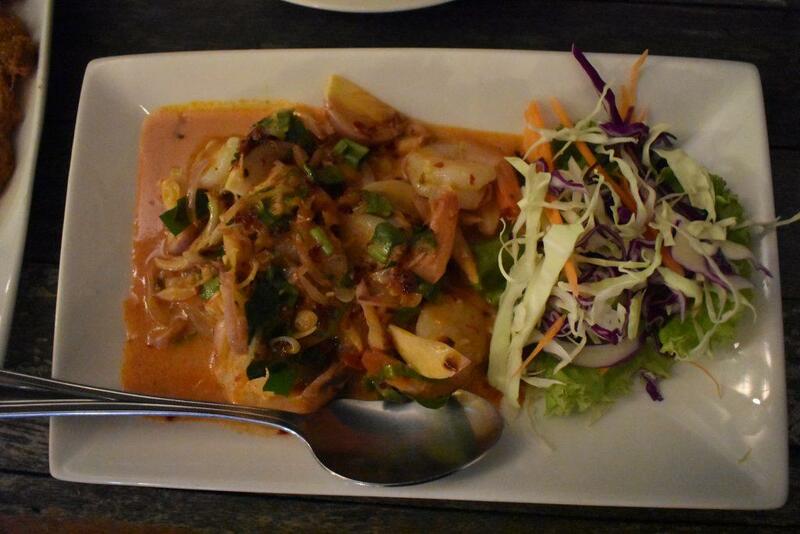 The food is Homestyle Thai cuisine. 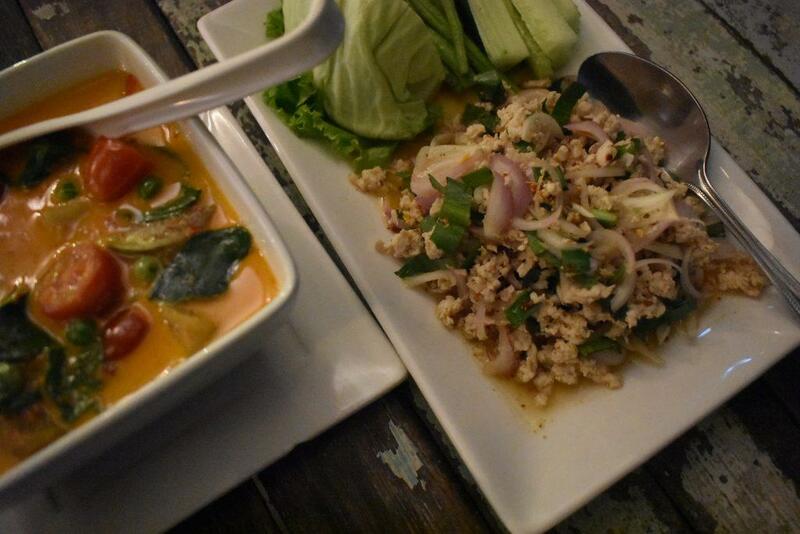 The menu is extensive featuring classic Thai dishes as well as southern, northern and vegetarian dishes along with fresh seafood. Prices are reasonable with mains from 140-400 baht, beers from 75 baht, cocktails from 190 baht, wine 160 baht/glass or from 890 baht/bottle. Apart from dining and enjoying the great river views you can feed fish at the temple pier or visit the temple behind the restaurant which features a sacred statue of the Lord Buddha and a 3 headed Erawan elephant statue. Location: 68 Sri Ayuthaya road, Soi Sri Ayuthaya 21 (Devet), Vachiraphayabaan, Dusit, Bangkok. Taxi to Thewarat kunchorn Worawihan Temple (next to the National Library on Samsen Road). Walk from the temple to the temple pier. Steve is next to the pier. Chao Phraya Express Boat to Thewet Pier. Walk from the pier and cross the canal via the small bridge on your left. Then follow the road to the Thewarat kunchorn Worawihan temple. Walk from the temple to the temple pier. Steve is next to the pier.